The Aerospace/Defense – Major Diversified industry is expected to underperform the S&P broader market moderately next quarter and in 2015, outperform modestly beyond. Mean/high targets for the 3 largest Aerospace/Defense Major Diversified companies – Northrop Grumman (NOC), Textron (TXT), and GenCorp (GY) - range from 0% to 17% above current prices. Find out which among Northrop, Textron and GenCorp offers the best stock performance and investment value. * All data are as of the close of Monday, November 3, 2014. As the U.S. government intensifies its air strikes against the Islamic extremist terror group Islamic State, with the three-month long Operation Inherent Resolve already costing the government more than $424 billion, defense contractors are due for some hefty allocations of new government spending. Total military spending this past Q3 rose to $149 billion, up from $137.9 billion in Q2, which in turn was up from $136.7 billion in Q1. Defense spending has been increasing at a faster rate all year. Among the beneficiaries of this increased spending are the three largest U.S. Aerospace/Defense Major Diversified companies. Who are they and what do they provide? • Northrop Grumman Corporation (NYSE: NOC), headquartered in Falls Church, Virginia, designs and manufactures aerospace electronics and information systems, manned and unmanned aircraft, spacecraft, high-energy laser systems, and microelectronics used by the aerospace industry and government militaries for such applications as intelligence surveillance and reconnaissance, communications, battle management, strike operations, electronic warfare, earth observation, satellite communications, space science and space exploration. • Textron Inc. (NYSE: TXT), headquartered in Providence, Rhode Island, manufactures business jets, single-engine utility turboprops, and single-engine piston aircraft for militaries and commercial businesses. It also produces unmanned aircraft systems, armored vehicles, marine craft, smart weapons, surveillance systems, protection systems, and test equipment and training solutions including simulators. • GenCorp Inc. (NYSE: GY), headquartered in Rancho Cordova, California, manufactures aerospace and defense products including liquid, solid, and air-breathing propulsion systems, missile defense systems, maneuvering propulsion systems, precision war-fighting systems, and strategic, tactical, precision strike and long range missiles. It also produces liquid, solid, and electric propulsion systems and components for space systems, expendable and reusable launch vehicles, manned and unmanned spacecraft, separation and maneuvering systems, satellites, large solid boosters, and integrated propulsion subsystems. As military spending over the years has steadily increased, so have the stocks of all three companies here compared, as graphed below. Where the broader market S&P 500 index [black] has gained 199% and the SPDR Industrial Sector ETF (NYSE: XLI) [blue] has gained 250% since the economic recovery began in March 2009, Northrop [beige] has ascended 345%, GenCorp has soared 790%, and Textron has skyrocketed 945%. On an annualized basis, where the S&P broader market has averaged 35.18% and the industrials fund XLI has averaged 44.12%, Northrop has averaged 60.88%, GenCorp has averaged 139.41%, while Textron has averaged a dizzying 166.76% per year! As government funding has recently been increased, we can expect near term earnings growth in the Aerospace/Defense industry to outperform the broader market average in the current quarter, as tabled below where green indicates outperformance while yellow denotes underperformance. Though the industry is seen lagging a little over the medium term throughout 2015, its longer term fiver year average earnings growth is expected to once again outgrow that of the overall market. Zooming-in a little closer, the three largest U.S. companies in the industry are seen putting in a split performance versus their industry peers reminiscent of their advancements over the past few years, with Textron and GenCorp leading the way. Compared to the broader market, growth performances look much the same, with Textron and GenCorp seen outgrowing the S&P average earnings from the present quarter and on over the longer term. Northrop, however, is expected to struggle with below-market earnings growth over the near term, which eventually picks up over the longer term - though still underperforming the broader market and its peers. But there is more than earnings growth to consider when sizing up a company as a potential investment. How do the three compare against one another in other metrics, and which makes the best investment? Let's answer that by comparing their company fundamentals using the following format: a) financial comparisons, b) estimates and analyst recommendations, and c) rankings with accompanying data table. As we compare each metric, the best performing company will be shaded green while the worst performing will be shaded yellow, which will later be tallied for the final ranking. • Market Capitalization: While company size does not necessarily imply an advantage and is thus not ranked, it is important as a denominator against which other financial data will be compared for ranking. • Growth: Since revenues and expenses can vary greatly from one season to another, growth is measured on a year-over-year quarterly basis, where Q1 of this year is compared to Q1 of the previous year, for example. In the most recently reported quarter, Textron delivered up the highest revenue growth while Northrop had its revenues shrink. Since GenCorp's quarterly earnings growth rate is not available, the metric will not factor into the comparison, though it is worthy of mention that Textron posted impressive earnings growth, while Northrop saw its earnings shrink year-over-year. • Profitability: A company's margins are important in determining how much profit the company generates from its sales. Operating margin indicates the percentage earned after operating costs, such as labor, materials, and overhead. Profit margin indicates the profit left over after operating costs plus all other costs, including debt, interest, taxes and depreciation. Of our three contestants, Northrop operated with the widest profit and operating margins, while GenCorp contended with the narrowest, even posting negative profit margins which denote loss. • Management Effectiveness: Shareholders are keenly interested in management's ability to do more with what has been given to it. Management's effectiveness is measured by the returns generated from the assets under its control, and from the equity invested into the company by shareholders. In returns on assets, Northrop's management team returned the most, while GenCorp returned the least. Since GenCorp's returns on equity are not available, the metric will not factor into the comparison, though it is worthy of mention that Northrop's team delivered greater returns on equity than Textron's team. • Earnings Per Share: Of all the metrics measuring a company's income, earnings per share is probably the most meaningful to shareholders, as this represents the value that the company is adding to each share outstanding. Since the number of shares outstanding varies from company to company, I prefer to convert EPS into a percentage of the current stock price to better determine where an investment could gain the most value. Of the three companies here compared, Northrop provides common stock holders with the greatest diluted earnings per share gain as a percentage of its current share price, while GenCorp's DEPS over stock price was negative, denoting loss. • Share Price Value: Even if a company outperforms its peers on all the above metrics, however, investors may still shy away from its stock if its price is already trading too high. This is where the stock price relative to forward earnings and company book value come under scrutiny, as well as the stock price relative to earnings relative to earnings growth, known as the PEG ratio. Lower ratios indicate the stock price is currently trading at a cheaper price than its peers, and might thus be a bargain. Among our three combatants, Northrop has the cheapest stock price relative to forward earnings, while GenCorp's stock is cheapest relative to 5-year PEG. Since GenCorp's price to company book value is not available, the metric will not factor into the comparison. Of course, no matter how skilled we perceive ourselves to be at gauging a stock's prospects as an investment, we'd be wise to at least consider what professional analysts and the companies themselves are projecting - including estimated future earnings per share and the growth rate of those earnings, stock price targets, and buy/sell recommendations. • Earnings Estimates: To properly compare estimated future earnings per share across multiple companies, we would need to convert them into a percentage of their stocks' current prices. Of our three specimens, Textron has the highest earnings percentages over current stock price for the current quarter, while Northrop has the highest percentages for 2015. 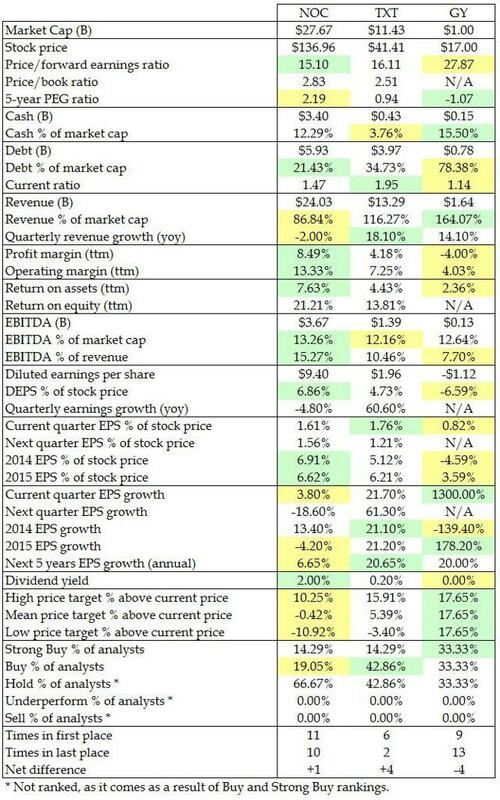 GenCorp, however, offers the lowest earnings percentages. • Earnings Growth: For long-term investors this metric is one of the most important to consider, as it denotes the percentage by which earnings are expected to grow or shrink as compared to earnings from corresponding periods a year prior. For earnings growth, GenCorp is projected to deliver the greatest growth overall, with Textron taking a slight lead over the next five years. At the slow end of the scale, Northrop is seen delivering the slowest earnings growth with some shrinkage in growth in 2015. • Price Targets: Like earnings estimates above, a company's stock price targets must also be converted into a percentage of its current price to properly compare multiple companies. For their high, mean and low price targets over the coming 12 months, analysts believe GenCorp's stock has the greatest upside potential and least downside risk, while Northrop's stock is believed to have the least upside potential and greatest downside risk. It must be noted, however, that GenCorp currently has only one broker putting forth targets, choosing $20.00 for all three levels with the stock currently trading at $17.00. • Buy/Sell Recommendations: After all is said and done, perhaps the one gauge that sums it all up are analyst recommendations. These have been converted into the percentage of analysts recommending each level. However, I factor only the strong buy and buy recommendations into the ranking. Hold, underperform and sell recommendations are not ranked since they are determined after determining the winners of the strong buy and buy categories, and would only be negating those winners of their duly earned titles. Of our three contenders, GenCorp is best recommended with 1 strong buy and 1 buy representing a combined 66.66% of its 3 analysts, followed by Textron with 2 strong buy and 6 buy recommendations representing 57.15% of its 14 analysts, and lastly by Northrop with 3 strong buy and 4 buy ratings representing 33.33% of its 21 analysts. Having crunched all the numbers and compared all the projections, the time has come to tally up the wins and losses and rank our three competitors against one another. In the table below you will find all of the data considered above plus a few others not reviewed. Here is where using a company's market cap as a denominator comes into play, as much of the data in the table has been converted into a percentage of market cap for a fair comparison. The first and last placed companies are shaded. We then add together each company's finishes to determine its overall ranking, with first place finishes counting as merits while last place finishes count as demerits. And the winner is… Textron flying high above the rest, outperforming in 6 metrics and underperforming in 2 for a next score of +4, followed closely behind by Northrop, outperforming in 11 metrics and underperforming in 10 for a net score of +1, and finally by GenCorp off in the distance, outperforming in 9 metrics and underperforming in 13 for a net score of -4. Where the Aerospace/Defense - Major Diversified industry is expected to underperform the S&P broader market moderately next quarter and in 2015, and outperform modestly beyond, the three largest U.S. contractors in the space are seen continuing along much the same trajectory they've been flying over the past few years, with Textron and GenCorp leading in earnings growth while Northrop grows slower than the broader market and its peers. Yet after taking all company fundamentals into account, Textron soars high above its peers given its highest current ratio, highest trailing revenue growth, highest future earnings over stock price in the current quarter, highest earnings growth over the next 5 years, and most analyst buy recommendations - handily winning the Aerospace/Defense - Major Diversified industry competition.